Just how impressive was Final #1? Heading into Final Jeopardy! on Thursday, our three finalists had a combined total of $56,600. That’s more than the total available on the board: $54,000. Of course, the three Daily Doubles allowed the players to exceed that amount: Arthur picked up $2,400 on a $800 clue, and Julia gained $4,400 and $5,000 on a pair of $1,600 clues. If you count the Daily Doubles as the value of the clue – commonly called the Coryat score – our players would have amassed $48,800. WANTED: for murder of two innocent boards. I pointed out in my recap that the $56,600 total had been topped just 19 times before, in the 13 years since clue values were doubled. However, this stat fails to consider that all three players were still very much alive heading into Final. For example, the highest total – $69,400 – was in a 2008 Teen Tournament quarterfinal in which the top player had $50,000. Not much of a gunfight there. That leaves just two games that were as competitive as Thursday’s. Their combined Coryat was $47,000; two clues were triple-stumpers, and they combined for three incorrect responses. All three advanced to the semifinals. Ben made it to the finals; he had a lead of $40,000-$14,200 after Day One and still lost, which I’m guessing is a record. Future TOCer Ashok Poozhikunnel, in his fourth game, got a bit of a gift from Lee Ann Roberts, a friend of The Final Wager. Their combined Coryat score was $51,000; there were only two triple-stumpers and one incorrect response. Will our Finalists put up a similar display on Friday? 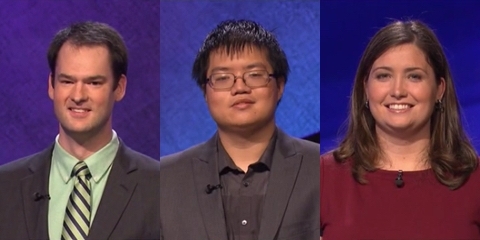 Will Ben go 13/13 on Final Jeopardy! clues? Tune in to find out! Thanks for the shout-out. Obviously I should have spent some time studying wagering strategy! Very nice – with an evenly spaced scores situation to boot!